Bucks Survivor: Round Five ~ The Bucky Channel - The World of Sports from Wisconsin's Perspective. After four weeks of intense Bucks Survivor challenges, I have already ran out of challenges that make sense as to see which team should be put on the chopping block. But that works out just find for this Bucks team, as they really have exemplified the meaning of a team all season. So the Young Bucks and the Veterans have been asked to go at this thing together, with all eleven members of the Bucks on the chopping block. No more immunity. Which Buck will earn the title of Bucks Survivor? Can Andrew Bogut be dethroned? Will the rookie Brandon Jennings add to his already impressive mantel of awards? Or will a surprise player emerge victorious? 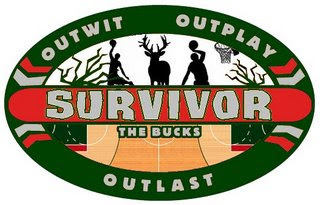 All that and more, on this week's Bucks Survivor! And oh yeah, Darnell Jackson was eliminated this week. The remaining contestants are as follows - Andrew Bogut, Brandon Jennings, Ersan Ilyasova, Carlos Del3no, Luc Richard Mbah a Moute, Royal Ivey, John Salmons, Luke Ridnour, Jerry Stackhouse, Kurt Thomas, and Dan Gadzuric all remain in the game. Now, since I'm a little inspired by Tuesday night's episode of Lost, we're going to do something we've never done before - TRIPLE ELIMINATION. If Lost can kill off ancillary characters at ease as they get closer to their finale, so can we. The voting is going to be extended to one full week, so make sure you vote early and tell your friends often. It gets a little depressing when I have to go to the Public Library and vote on every computer there in an effort to inflate the voting totals. But eleven Bucks are being put on the chopping block, and the top three vote getters will be cut this time next Tuesday. Have fun my friends, and voting can be done at the top right of this blog. Remember, vote for which Bucks you'd like to eliminate.